Copenhagen studio Henning Larsen Architects and Icelandic studio Batteriid Architects have completed a concert hall and conference centre in Reykjavík, Iceland, in collaboration with artist Olafur Eliasson. Panes of clear and colour-coated glass surround a steel framework of twelve-sided modules on the south facade of the Harpa Concert and Conference Centre. Inspired by basalt crystals, the faceted glass scatters reflections of the surrounding harbour and sky, and presents a glittering wall of light after dark. A flattened version of this geometry surrounds the other elevations of the building. Three large concert halls occupy the first floor, including one finished entirely in red, while a smaller fourth hall on the ground floor provides a venue for intimate performances and banquets. Visitors access the main foyer from a south-facing entrance, while staff and performers enter the backstage area from the north. The project was featured on Dezeen last year, when it was still under construction - see our earlier story here. See more projects by Henning Larsen Architects on Dezeen here, and more projects by artist Olafur Eliasson here. Harpa Concert Hall and Conference Centre in Reykjavik gathers inspiration from the northern lights and the dramatic Icelandic scenery. Situated on the border between land and sea, the Centre stands out as a large, radiant sculpture reflecting both sky and harbour space as well as the vibrant life of the city. The spectacular facades have been designed in close collaboration between Henning Larsen Architects, the Danish-Icelandic artist Olafur Eliasson and the engineering companies Rambøll and ArtEngineering GmbH from Germany. The Concert Hall and Conference Centre of 28,000 m2 is situated in a solitary spot with a clear view of the enormous sea and the mountains surrounding Reykjavik. The Centre features an arrival and foyer area in the front of the building, four halls in the middle and a backstage area with offices, administration, rehearsal hall and changing room in the back of the building. The three large halls are placed next to each other with public access on the south side and backstage access from the north. The fourth floor is a multifunctional hall with room for more intimate shows and banquets. Seen from the foyer, the halls form a mountain-like massif that similar to basalt rock on the coast forms a stark contrast to the expressive and open facade. At the core of the rock, the largest hall of the Centre, the main concert hall, reveals its interior as a red-hot centre of force. The project is designed in collaboration with the local architectural company, Batteríið Architects. 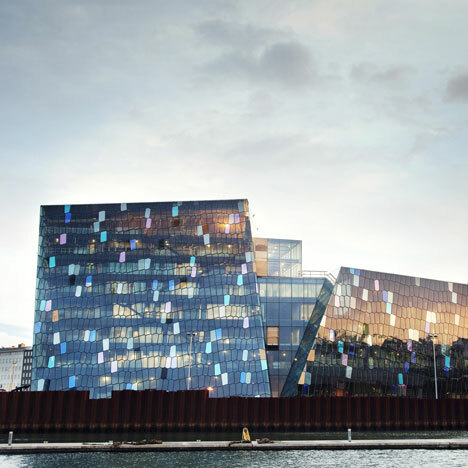 Harpa - Reykjavik Concert Hall and Conference Centre forms part of an extensive harbour development project in Reykjavik, the East Harbour Project. As the name indicates, the overall objective of the project is to expand and revitalise Reykjavik's eastern harbour with a new downtown plaza, a shopping street, a hotel, residential buildings, educational institutions and mixed industry. The overall intention is to generate life in the area and to create a better connection between the city centre and the harbour. Situated outside the city's building mass, the building will become a significant icon in the city - a visual attractor with a powerful and varying expression. The isolated location will mean that, to a great extent, the changing climatic and light effects will be exposed in the facades of the concert building, often in contrast to the narrow and shady streets in the rest of the city. Henning Larsen Architects has designed the facade of the Concert Hall in close collaboration with the local architects Batteríið Architects and the Danish-Icelandic artist Olafur Eliasson. As the rest of the building, the design of the facades is inspired by nature. In particular, the characteristic local basalt formations have provided the inspiration for the geometric facade structure. Made of glass and steel in a twelve-sided space-filling geometric modular system called the 'quasibrick', the building appears a kaleidoscopic play of colours, reflected in the more than 1000 quasibricks composing the southern facade. The remaining facades and the roof are made of sectional representations of this geometric system, resulting in two-dimensional flat facades of five and sixsided structural frames. In order to develop these ideas the team worked with three-dimensional computer models, finite element modelling, various digital visualisation techniques as well as maquettes, models and mock-ups. Light and transparency are key elements in the building. The crystalline structure, created by the geometric figures of the facade, captures and reflects the light - promoting the dialogue between the building, city and surrounding landscape. One of the main ideas has been to "dematerialise" the building as a static entity and let it respond to the surrounding colours - the city lights, ocean and glow of the sky. In this way, the expression of the facade changes according to the visual angle. With the continuously changing scenery, the building will appear in an endless variation of colours.